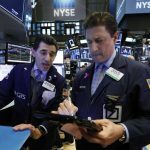 U.S. stock indexes were mostly flat Tuesday afternoon as losses for banks and big technology companies offset gains elsewhere in the market. The stagnant movement came a day after the market failed to hold on to an early gain. Citigroup slumped 1.3 percent, while Micron Technology dropped 1.4 percent. Homebuilders declined broadly after the government reported that sales of new U.S. homes rose in December from the previous month, but also declined from a year earlier. Papa John’s International rose after reaching a settlement with founder John Schnatter that calls for him step down from the board once an independent director replaces him. Investors were hoping that more details would emerge from media reports Monday that the U.S. and China were getting closer to resolving their trade dispute. The market has often jumped on hopes that progress was being made on the trade talks, only to fall back later as details didn’t come through. Meanwhile, China plans to take additional measures to help shore up its cooling economy. The nation’s growth target for the year is now between 6 percent and 6.5 percent. That’s slightly below last year’s 6.6 percent growth rate. KEEPING SCORE: The Dow Jones Industrial Average dropped 20 points, or 0.1 percent, to 25,799 as of 1:47 p.m. Eastern Time. The S&P 500 index was down 0.2 percent, while the Nasdaq composite was up less than 0.1 percent. Major indexes in Europe rose. MIXED REPORT: The Commerce Department said sales of new U.S. homes rose 3.7 percent in December, the highest pace in seven months. Even so, sales were down from a year earlier. Homebuilders declined following the release of the report. Meritage Homes slid 3.5 percent. UPSIDE DOWN SMILE: Align Technology slid 6.8 percent on news that the dental products company will close all its Invisalign stores and expects a charge in the first quarter. Target noted strong online sales and traffic growth during the crucial holiday sales quarter. The company and its peers had to deal with an overall slowdown in retail sales at the end of 2018 while also competing with e-commerce behemoth Amazon. Kohl’s jumped 6.8 percent following a similarly upbeat fourth-quarter report and forecast. PIZZA’S UP: Papa John’s International climbed 4.7 percent after the company reached a settlement with founder John Schnatter that includes him resigning from the board of directors. The company has been floundering since Schnatter took a series of missteps, first blaming disappointing sales on NFL player protests and then using a racial slur during a company conference call. He stepped down as CEO in 2017 and later resigned as chairman of the board. ICAHN OUT: Shares in Hertz Global Holdings slumped 13.3 percent after activist investor Carl Icahn cut his holdings in the car rental company after it reported upbeat fourth-quarter results.